Dried and fabric flowers have come a long way. No longer do they smack of “artificial” and “tacky” but instead they are making a bit of a comeback. Dried flowers in particular are increasingly popular particularly since there has been a rise in the number of specialist growers for this area. Gone are the days when you could only get dried lavender or barley wheat. Now there is an amazing range of flowers and foliage, as well as seed heads of every description. They can be dyed every colour of the rainbow and used for every occasion from table displays through to weddings. Fabric flowers and foliage have also moved on and thanks to more effort from manufacturers, the colouring and detail are now so realistic that they can sometimes be mistaken for real ones. Add a few wonderful trimmings and from a distance only you would know they were artificial! Florist wholesalers are also catering more for the artificial market by stocking dry foam in all shapes and colours including dry wedding bouquet holders. Of course they are not everyone’s cup of tea but fabric flowers do have their own place in floral society. They are highly practical and can be used in situations where fresh flowers just aren’t suitable. This could be if someone has hay fever or the environment to which they are going is too hot and humid to sustain fresh flowers for any length of time. Certainly a lot of hospitals are banning fresh flowers being brought it in because of health and safety reasons, so an artificial display on this occasion is ideal, and more and more offices are using good quality displays because they are more cost effective than fresh. Because they are now more realistic, fabric flowers are becoming popular at weddings – they are used from everything from corsages and buttonholes to bouquets and pedestal arrangements. The flowers you want are always in season and there’s also the added advantage that the bride/bridesmaids can keep their bouquets forever! From a florist’s point of view they can be made well in advance so there is no rushing round on the day or panic that the flowers have wilted! You use the same principle designs as if you were using fresh flowers but obviously with some artificial flowers or foliage you don’t get the same natural movement. This is particularly true of artificial foliage which may, unless you go for the expensive silk type, may be very stiff. Dried flowers have always been more popular than their fabric counterpart. They are natural, long-lasting and retain their beauty and warmth – they also appear to fit in everywhere from cosy country cottages to modern buildings depending on the variety. There are so many amazing textures and contrasts with dried flowers. Beautiful seed heads or exotic grasses look wonderful in tall glass vases while pastel colours look stunning in a less formal environment. Rich colours such as burgundy, purples or deep greens are becoming very popular to add warmth and instant impact. These days drying fruit has become very popular. Oranges, lemons, limes etc can all be seen in displays, along with nuts and other seeds. 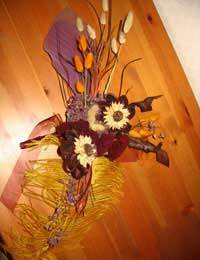 Dried flowers are equally as easy to work with. Again many of them don’t have the movement of natural flowers and they do have a tendency to crumble if they are not handled properly, but treat them gently, remember all the design principles of working with fresh flowers and there is no reason why you can’t do some wonderful arrangements including hand tied bouquets and wedding designs. These sound horrible but they are actually very effective and perfect for offices or corporate events. Artificial bay trees or box shrubs are very popular for weddings and can be bought from any good floral wholesalers. There are some companies that even hire them out.